Vatche Mavlian, Spider-Man & Wolverine #2. In a conversation with SHIELD agent Dum Dum Dugan, Logan repeats that he was a secret agent after his fight with the Hulk. Logan remembers being in East Berlin with his best friend, an extraordinary freelance intelligence agent by the name of Charlemagne. Working for the KGB (against Logan’s advice), Charlie is eventually been double-crossed and contacts Logan for help. Arriving in his Wolverine uniform, Logan faces off against fifty undercover KGB agents pursuing Charlie. Against Charlie’s wishes, Logan gives into his berserker rage and slaughters the KGB agents, giving Charlie time to escape. Logan tells Alison Blaire and her friend O.Z. that he tussled with Vladimir Semyanovitch Zaitsev of the KGB, “Wetwork specialist. Mayhem and assassination.” Zaitsev confirms that he fought against Wolverine. Logan further adds that Henry Peter Gyrich was his CIA liaison when he worked for Canadian Special Intelligence. Considering Gyrich knows Logan as Wolverine, we can assume their relationship was from this time period. Wolverine reveals that he knows Terror, a hideous being capable of replacing parts of his body with those of other creatures. Logan claims no friendship with this mercenary but does acknowledge his prowess in retrieving information from the dead by tapping into memories stored within their lifeless flesh. Terror claims, “There’s a long-standing series of markers called and due between myself and Logan, a.k.a. the mutant ‘Wolverine’. He is familiar with Logan ‘s berserker rages, but does seem to view Logan as one of the good guys. Logan knows Deadpool as the mercenary Wade Wilson, and the two seem to share a history. Deadpool seems to be familiar with Logan’s claws, his berserker rage, and “dissertations on honor, pride…” and such. Logan tells Deadpool, “Junk between you and me, better if it never sees the light of day… past should stay in the past.” He further notes that Wilson has no sense of honor, and that he is aware of Wilson’s past. All in all, this would suggest that Logan interacted with Wilson before he was treated for cancer and transformed into Deadpool. In another connection to the Far East, Wolverine claims that the British Secret Service Agent Clive Reston, best known for working with Shang-Chi, son of Fu Manchu, is a friend of his. Logan comments that he used to work with Asano Kimura from Japanese Intelligence. “One o’ their top people an’ a friend. We ran more’n our share o’ dirty missions together… an’ we owe each other our lives a couple o’ times over.” It is probable the two worked together before and after the Wolverine’s first mission against the Hulk. 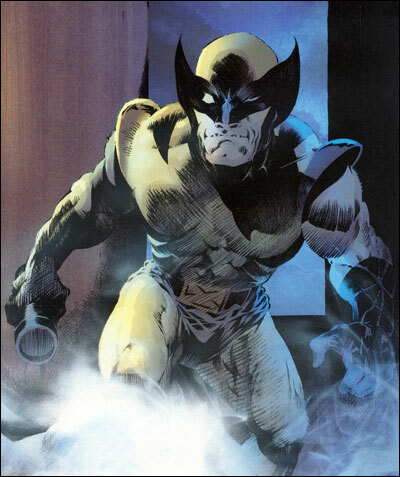 The Wolverine, in his costume, breaks into Takeshi Kishimoto’s compound in Japan to find evidence that he is a drug dealer. Instead of leaving immediately, Wolverine comes across Takeshi Kishimoto’s daughter and a liaison ensues, one that causes Takeshi Kishimoto to hold a grudge for many years. Wolverine remembers it taking place some 12 to 20 years before the present, which with Marvel Time, could easily place it here. Takeshi Kishimoto suggests that is was 12 years before the present that these events occurred. A thug named Johnny Jack from the Salty Dog saloon in Madripoor remembers Logan from long ago, not as his modern persona Patch, but as Logan, suggesting their interactions took place at this time. Considering that Johnny Jack is not afraid of Logan, it would seem that Logan never pummeled him in a fight. Logan tells Kitty Pryde that Seraph took on Sabretooth to save him. She dies in his arms as he wears his Wolverine costume. Viper, a freelance agent and later of Hydra, fights to get them home, assisting Logan at Seraph’s request. As a result, Logan’s debt of honor falls to Viper who is entitled to receive whatever she asks of Logan. Leinil Francis Lu, Edgar Tadeo & Gerry Alanguilan, Wolverine #126. 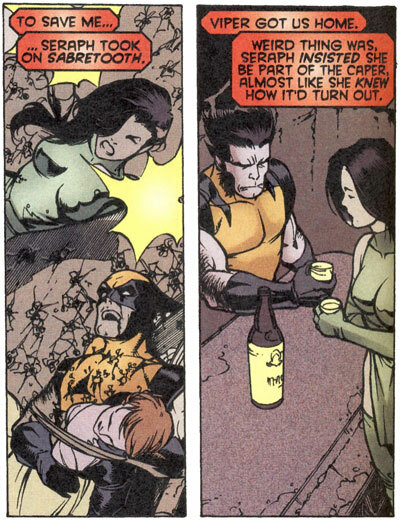 Viper reminds Logan that Seraph died in the labyrinth-style cellar below Seraph’s bar in low town Madripoor, and that Logan swore a vow on Seraph’s tomb to give Viper whatever she asked for, whenever she asked. Logan spends four months in Hong Kong with a girl named Wong Ai-Chia and the last three months include drinking with a 50-year-old expert assassin by the name of McLeish who goes by the nickname of the White Ghost. McLeish recalls the first time he met Logan when he was convinced that Logan was going to kill the Hong Kong policeman who was harassing him. McLeish relates that he saw Logan fight and kill a Triad enforcer in Hong Kong with his claws, healing wounds in minutes. He warns Logan that despite his advantages, he can still be killed. Logan reveals that he had Canadian Intelligence check out McLeish while he was in Hong Kong. McLeish admits to Logan that he has killed hundreds of people… and loved it. In Hong Kong, McLeish and Logan discuss killing philosophies at a party McLeish set up exclusively for assassins. Logan and Ai-Chia go to the movies on Thursday as they always do, but because the film is in Mandarin they leave early. Ai-Chia’s father, Wong Tak-Wah, is a film producer, and Ai-Chia reviews all the new films in Hong Kong for him. As they arrive at Tak-Wah’s office, they discover his lifeless body on the floor. Logan realizes McLeish assassinated Ai-Chia’s father and speeds off on a motorcycle to catch him. 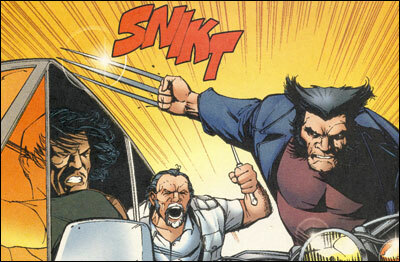 In a long chase through Hong Kong, Logan tracks down McLeish’s getaway car and kills his driver with his claws. McLeish regains control of the white Cadillac and rams Logan’s bike, sending him careening. Before long, McLeish reaches his boat and meets his contact from the Triad who contracted him for the hit. As the kill is confirmed and McLeish counts his money, Logan, much the worse for wear, arrives and heaves his motorcycle at McLeish, breaking his back and pinning him underneath the vehicle. When the Triad gunman fires at Logan, the spark from the gun ignites the dripping gasoline from Logan’s motorcycle, blowing up the boat in a spectacular explosion. Leinil Francis Yu and Edgar Tadeo, Wolverine#119. At the Hong Kong airport, Ai-Chia and Logan say their goodbyes after her father’s death. The revelation that Logan knew her father’s assassin is too much for Ai-Chia to take, and Logan decides to return to Canada.